There is a window of opportunity in this rapidly changing economy to acquire a larger slice of the competitive pie. "As is" core competencies and simply tightening up existing processes and services won't produce the new innovations and strategies needed to survive and gain competitive advantage. Classical process improvement, taken alone, is no longer enough. Whether you're acquiring, selling, merging, divesting, integrating an acquisition, developing innovation leadership or want to break through your revenue ceiling and increase the value of your brand, that's where we come in. The Challenge... To position both yourself and your organization to come out ahead of the pack now and in the recovery... To achieve true differentiation in the eyes of your customers and stakeholders, the key to adding value, expanding market share and increasing revenue... To derive and maintain a high level of satisfaction. Experience tells us that innovation starts with the individual, with personal energy; the ability to stay centered, flexible, creative and productive in the midst of intense activity and changing conditions. The development and employment of this ability, or personal power, is the key to achieving the competitive edge while deriving personal and professional satisfaction. However, when most business leaders want to create differentiation and a compelling reason for customers to purchase their services they frequently rely on new marketing messages and packaging, but the core competencies and entrenched systems of the company remain "as is". We are focused on helping clients achieve and execute the differentiation that will propel them to the next stage. 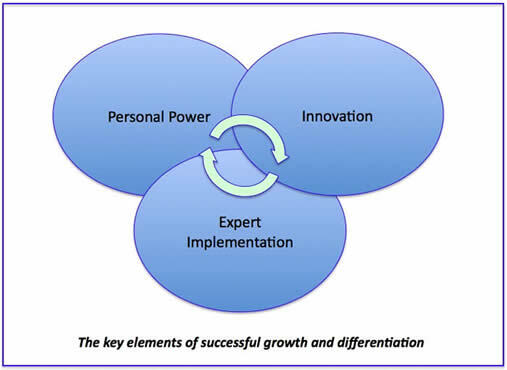 The three domains of personal power, innovation and expert implementation complement each other and implemented together produce dramatic break-through results, customer satisfaction and revenue. Process Improvement has a pre-defined scope and is solution-specific. Taken alone it yields bounded, expected and improved results for existing processes. Innovation is focused on executing your mission and purpose. Taken alone it has no implicit structure and tends to generate clouds of great ideas that may not generate results. Personal Power focuses on personal growth, resilience and expanded capacity for action. Taken alone it yields inner strength and serenity but does not yield tangible outcomes. The Value Staging team provides awareness and expertise developed over 30 years at GE, Big 5, Mercer, Investment Banking and as entrepreneurial business owners and leaders. We bring respected and established innovation, change management, process improvement and leadership development tools and methodology scaled for small and medium businesses as well as units of large organizations. Clients get proven, easy to work with, rapid-execution results leading to a clear and concise execution plan, coupled with ongoing monitoring and support to ensure that all benefits are realized. For leadership and our client organizations, we create a positive and compelling experience, both personally and professionally. "Ten years after founding my company, I wanted to move out of a day-to-day role in company operations. We needed to innovate and structure the firm so that it would run effectively when I stepped back. Herb helped us quickly develop and improve the business process, communication, roles and structure of the company, coached the leaders and staff and even conducted interviews and hired a COO. Effective day-to-day operations are in place and have been working well for all of us since then. Because of the structure Herb counseled us to implement, the company has been able to effortlessly grow with others at the helm."